Sustainability: the key word. For Salumificio Pedrazzoli, being a business has always meant doing business according to our family values: Dependability, honesty, respect, integrity and responsibility. Our commitment to consumers: to guarantee our products are finished to the highest standards. Every day we work tirelessly to deliver maximum quality in all of our products, and to monitor our supply chain as closely as possible. Our focus on an organic approach, nature, research and implementing “green friendly” practices is now part of our DNA as producers and farmers. We work organically because we think organically. For Salumificio Pedrazzoli, being a business has always meant doing business according to our family values: Dependability, Honesty, Respect, Integrity and Responsibility. In other words, for us, doing business means doing business responsibly. This is because we are highly aware that the influence of all of our choices, decisions and daily deeds extends beyond our own farms and establishments, impacting too on our partners, customers, consumers, suppliers and on the area/environment in which we operate. In other words, for us, doing business means doing business responsibly. It means we see our partners as family, with whom we work daily to create a calm working environment based on respect. It means that we promote and support the initiatives and projects of several local non-profit organisations and associations strongly engaged in social causes. Every day we aim to adhere to our values and act responsibly. For us, engaging responsibly means restoring value to the region we work in, to our invaluable partners and suppliers and, through our products, to our customers and consumers, who have been choosing us since 1951. 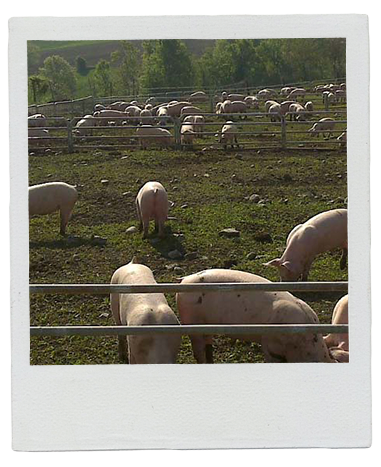 All our products – organic and traditional – are made with 100% Italian pork from our own farms; because our farms are located within an approx. 60 km radius of the factory, our pork is zero-mileage, ensuring better animal welfare and lower emission levels from transportation. We do not use preservatives, flours or other chemical additives, and we respect the natural maturation process of our products. Our supply chain boasts complete traceability and rigorous HACCP-based health and hygiene standards. Our “controlled supply chain” makes it possible to track our products “from farm to fork”; this means our customers and consumers have guaranteed transparency with regard to the origin and provenance of all the ingredients in our products. Our focus on an organic approach, nature, research and implementing “green friendly” practices is now part of our DNA as producers and farmers engaged in protecting the environment. In 2010 at the international showcase for organic excellence – the Biofach trade fair in Nuremberg – we wanted to build our stand in a 100% eco-friendly way, fully expressing our green commitment. So we had our stand built with Green Pallets© from Italian company Palm. 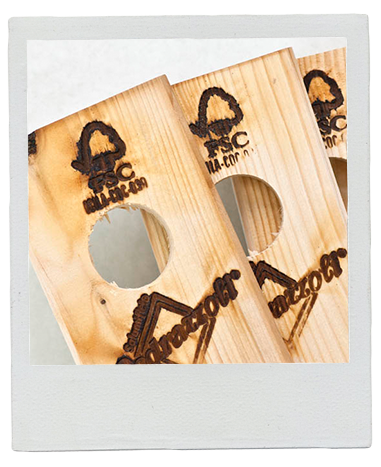 Their pallets are made from FSC-certified wood and 20% recycled material; they are the result of a project designed to protect the environment, offering a traceable supply chain all the way back to the raw material. The stand was designed to have a reduced environmental impact in that, at the end of its life, it would not become waste but would continue in its life cycle: being composed of separate modules, the stand will be reused at other trade fairs and to transport Salumificio Pedrazzoli’s organic deli meats. 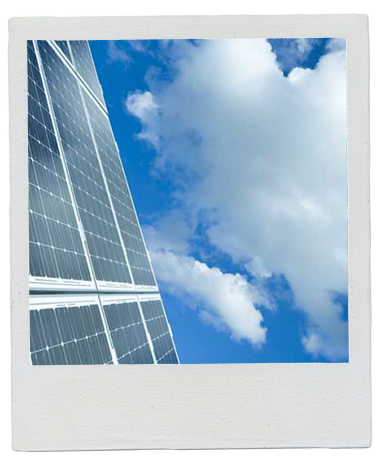 In 2011 the new photovoltaic system we installed on the roof of our factory was an important contribution to saving energy: 2650 high-efficiency photovoltaic panels capable of producing 200,000 kWh per year, or 20% of the company’s energy consumption. Because our offices are also eco-friendly, every department is engaged in our drive for environmental sustainability (separate waste collection, use of recycled paper and other materials, renewable toner cartridges and furniture and furnishings in recycled cardboard). We are equally focused on other aspects of environmental sustainability, as represented by our ambitious programme to reduce and gradually replace pallets and packaging with eco-compatible materials and to use FSC paper and materials in our hard-copy communications. From 2009 onwards we have been part of the “EcoFriends-Cittadini e Imprese amiche dell’Ambiente”, a non-profit environmental association of public/private organisations and individuals working together for environmental sustainability.